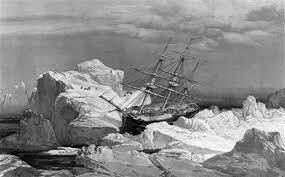 This month Parks Canada announced the discovery of one of the lost ships from Sir John Franklin’s Arctic expedition. The two ships from the Franklin expedition, HMS Erebus and HMS Terror, and their crews disappeared during a search for the Northwest Passage in 1846. Recent sonar images from the waters of Victoria Strait, just off King William Island in Nunavut, revealed the wreckage of a ship on the ocean floor.